One of the most interesting places in Turkey, Pamukkale appears as an abstract blue and white landscape drawn by nature. Featuring ponds filled with hot, healing water from underground springs, Pamukkale is one of Turkey's top tourist attractions and renowned for its healing hot springs even since the time of the Roman Empire. In fact, it was such a popular destination that a city – Hierapolis - was established in the area. Pamukkale is an important stop on an Aegean tour, located within the boundaries of Denizli, and offering many accommodation options. A Pamukkale tour begins with the famous white travertines and continues with the museum, an ancient pool and a theatre. 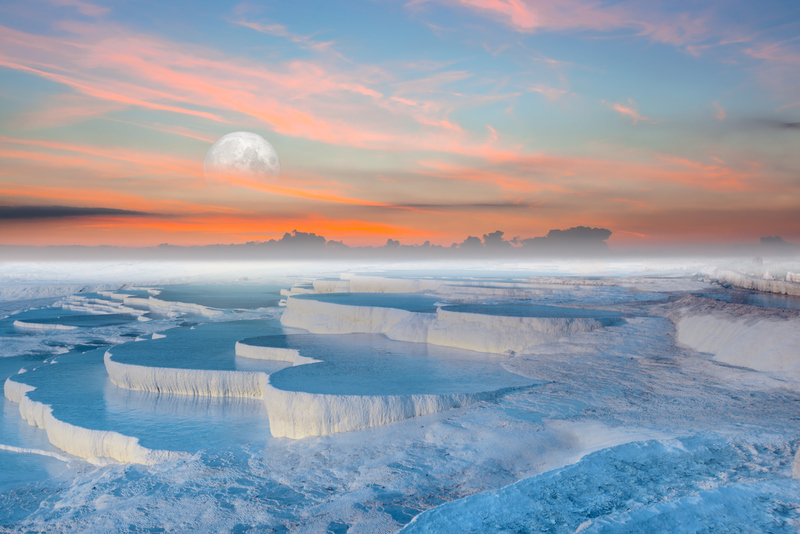 Pamukkale has an otherworldly quality, especially when viewing the travertines. Visitors can also enjoy paragliding and balloon tours, as well as fascinating views from an ancient hilltop theatre. The Denizli airport is close to Pamukkale, and easily reachable via Pegasus. Check out flight to Denizli page for great flight options. You can use public transportation departing from the city centre and the airport to reach the Pamukkale travertines, located 18 km from Denizli. There are many hotels, boutique hotels and pensions available in Pamukkale.